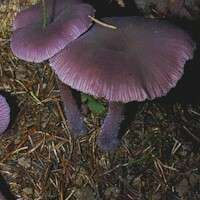 Laccaria amethystina is in most respects very similar to Laccaria laccata, the Deceiver, except that its overall colour is a deep violet (above) when wet and pale grey (below) when dry. These two species favour similar habitats and so they often appear side by side in small scattered groups. 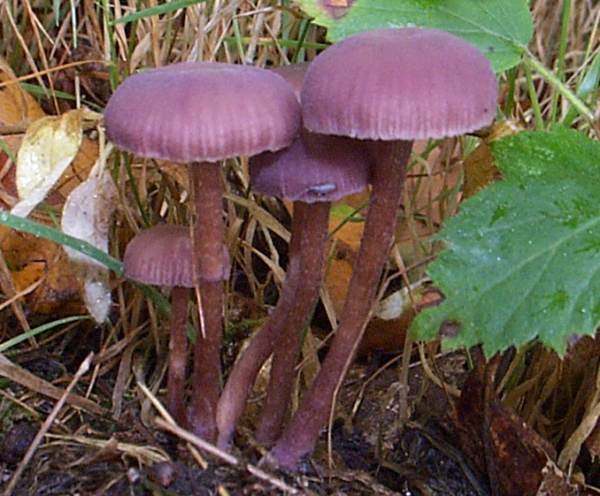 Widespread and common in Britain and Ireland, Laccaria amethystina occurs on mainland Europe, and in much of Asia and North America. Amethyst Deceiver was first described in 1778 by the English botanist William Hudson, who named it Agaricus amethystinus. (In the early days of fungal taxonomy most gilled mushrooms were placed in one gigantic Agaricus grouping, which has since been broken up into many other genera, leaving in the Agaricus genus a relatively small group of the 'true mushrooms', as they are sometimes called.) 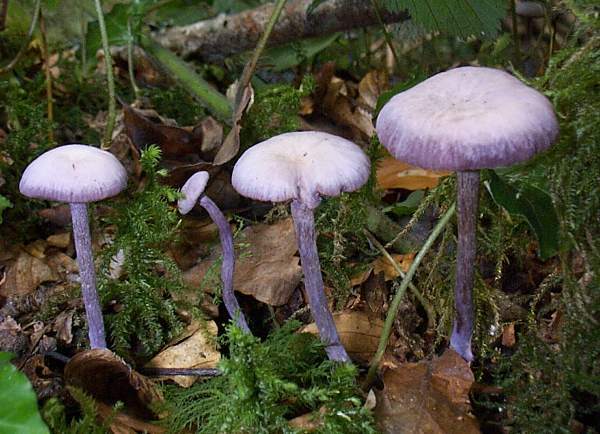 Another famous British mycologist, Mordecai Cubitt Cooke, moved this species into its present genus in 1884, at which time the scientific name became Laccaria amethystina. Synonyms of Laccaria amethystina include Agaricus amethysteus, Laccaria amethystea, Laccaria laccata var. amethystea, Omphalia amethystea, Agaricus amethystinus Huds., Agaricus lividopurpureus With., and Laccaria laccata var. amethystina (Cooke) Rea. The Amethyst Deceiver is categorised as Laccaria amethystea in many field guides that are currently in print as well as on several popular web pages. The specific epithet amethystina refers to the amethyst colouring of fresh cap of this woodland mushroom. When they grow among moss, the caps of this beautiful mushroom stand out and are very easy to find. More often they grow among dark damp leaf litter and sometimes go unnoticed until the caps begin turning pale. Old caps become almost white in dry weather and are easily mistaken for Laccaria laccata, the Deceiver or more seriously they could be confused with other small pale ochre or fawn mushrooms, some of which are poisonous. 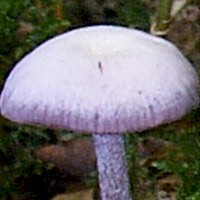 At one time this mushroom was considered merely as a variety of the Deceiver (Laccaria laccata), a species of the same general size and form but very variable in colour. 2 to 7cm in diameter, Amethys Deceiver caps are initially convex and become almost flat-topped at maturity. 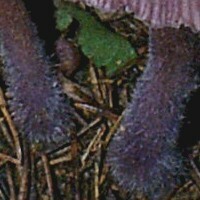 During wet weather young caps of Laccaria amethystina are deep purple (as is the specimen seen here alongside the tan coloured common Deceiver, Laccaria laccata). During dry spells the caps and stems of Laccaria laccata become much paler and eventually almost white. The specimen seen here is not yet completely dry; its cap is becoming paler from the centre. Eventually, Amethyst Deceivers become pale buff, as do the common Deceivers. This makes identification of old specimens even more difficult. 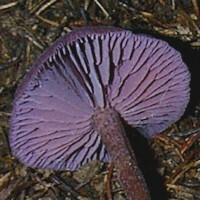 The broad, deep gills of the Amethyst Deceiver are widely spaced and interspersed with shorter gills. Long before the cap fades to buff, the gills begin losing their colour. This is because, perhaps surprisingly when you see how vivid the young gills are, the spores of this mushroom are white. If ever there is just one good example of why we should not take gill colour as a guide to spore colour, this surely is it! 5 to 10mm in diameter and 5 to 10cm tall, the tough, fibrous stems are increasingly more 'hairy' towards the base. Deep purple at first, but becoming paler as the caps fade, the stems of this woodland species are usually bent and often radially twisted. They are very tough and fibrous. 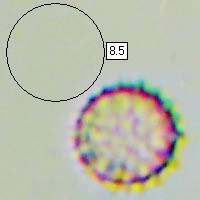 Roughly spherical, 8–11µm in diameter, covered in spines up to 1.5um tall; hyaline. Among leaf litter in all kinds of woodland but particularly plentiful under beech trees, with which it is ectomycorrhizal. 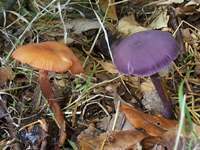 Amethyst Deceivers are also known to be able to form mycorrhizal associations with certain other broadleaf and coniferous trees. 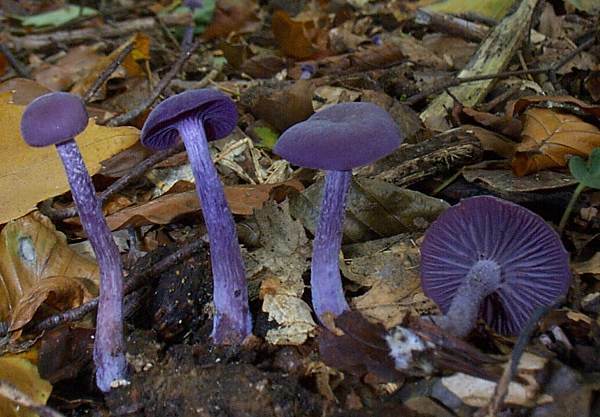 Mycena pura is a violet coloured bonnet mushroom, but it has pale gills and the stem is not fibrous. Laccaria amethystina the Amethyst Deceiver is edible, although it takes rather a lot of them to make a good meal. The fibrous stems of these mycorrhizal mushrooms are tough and inedible and so only the caps are worth collecting.